The need to encourage action on sustainable transport by the authorities in County Hall and Hastings Town Hall was one of the key themes aired at the September meeting of Hastings Sustainable Transport Forum. Nick Terdre reports. 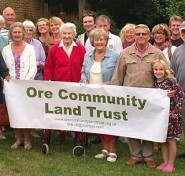 Hastings Borough Council have offered Ore Community Land Trust a 25-year lease on Ore Green, next to the Salvation Army Hall, boosting their campaign to protect Speckled Wood, writes Tony Polain, the trust’s vice chair.